I recently returned from a trip to Nicosia, Cyprus and if it did nothing for me aesthetically it did serve to foundate my already burning love of Greek food. On my first trip to Greece, Galaxidi to be precise I was literally knocked sideways by the quality, quantity and diversity of Greek food – it’s an assault on the senses…in short I love Greece and I love Greek food. 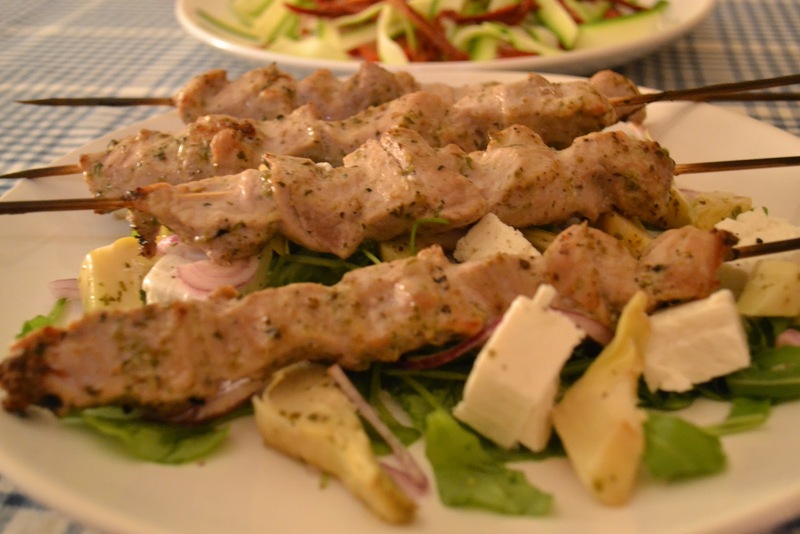 This is a dish I cook with monotonous regularity and it figures on just about ever single Greek menu you can find – it’s Souvlaki, simple seasoned and skewered meats served with a good salad or rice or even fries. Try it with chicken, fish, lamb or my own personally favourite, pork. salt and cracked black pepper – plenty of both! Dump all the pork into a deep dish or bowl, drop in the oregano, olive oil garlic, yogurt, salt and pepper and a squeeze of lemon juice – mix well together cling n sling in the fride for 1 hour. While the pork is getting groovy with the marinade in the fridge start soaking some wooden skewers – prevents the burning on the grill or under the broiler. When suitable soaked take out the pork and fill about 8-10 skewers with the pork then straight onto the heat. Watch the meat really closely – it will cook real quick and there is nothing worse than dry pork, it will take only 2-3 minute per side but cut into the meat to 100% sure it’s cooked. It is mandatory to serve this with a very, very good Taztiki (yogurt, garlic cucumber) – if you don’t you are breaking the law!! Serve the Souvlaki on a fresh leaf salad with sun dried tomatoes and artichoke hearts.